There are many advantages to buying yourself an electric vegetable steamer, and as the very satisfied owner of one myself, I wanted to share some of those advantages with you. I am certain that once you realise what a huge difference steaming can make to the quality of your food you will be dashing off to buy one for yourself. Steaming as a method of cooking is thought to pre-date the discovery of fire, when foods were steamed over hot springs or stones.Oriental cooking has always used steaming as a main cooking method, both for health reasons and because ovens are rare. Many foods are steamed as opposed to other cooking methods, (rice being perfect for this). The Chinese have used steamers for about 3000 years, with early steamers being made in stoneware and originating in the province of Yunnan. From around the eighth century, thin cypress strips were used to make steamers and today they are constructed from bamboo with woven slatted bases. These "baskets" can be stacked, usually up to three tiers, and placed over a wok containing boiling liquid. 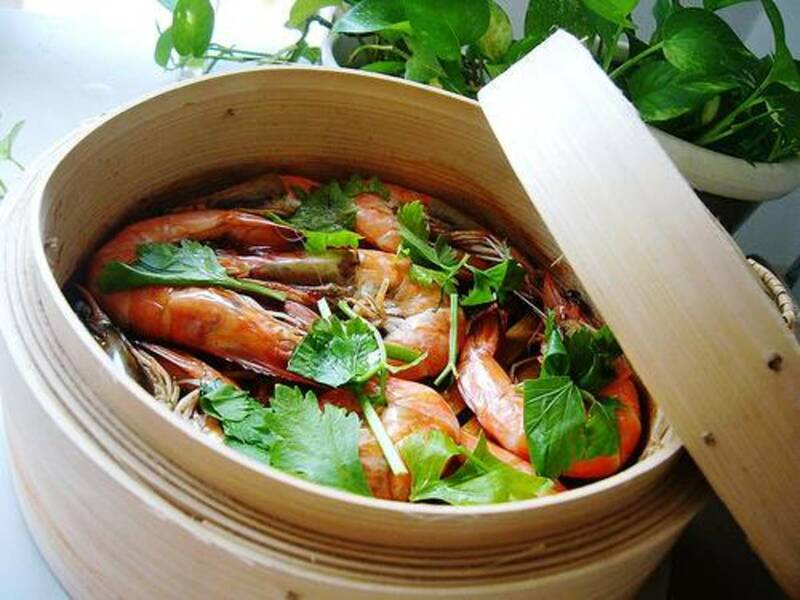 A tight-fitting bamboo lid seals in the steam until the vegetables are cooked. Steaming your vegetables allows them to retain their colour, texture, flavour and nutritional value. Vegetables are less likely to to break up after cooking (so long as you don't overdo the cooking time). 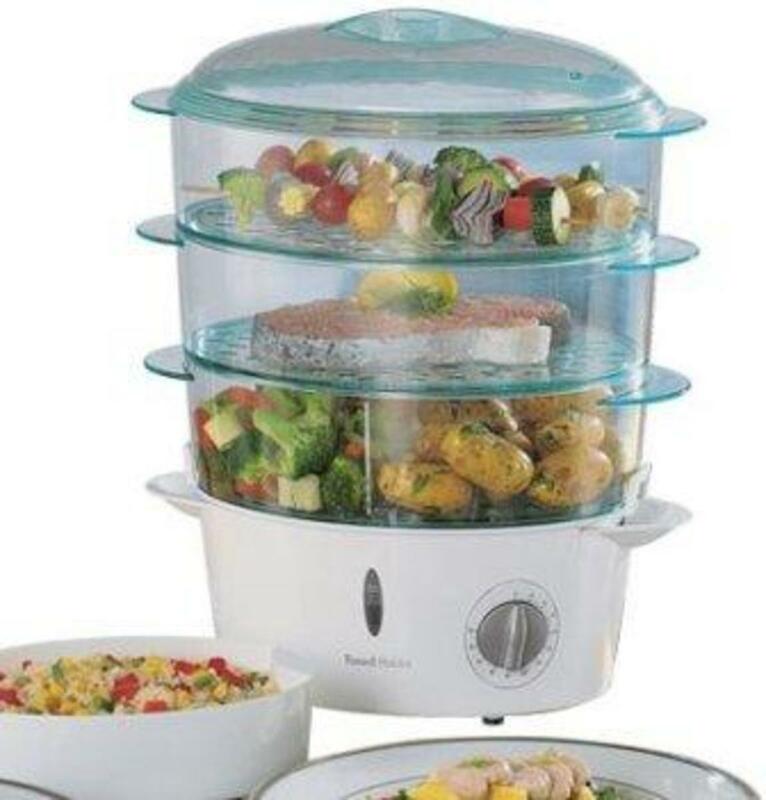 In a multiple tiered steamer more than one type of vegetable can be cooked at the same time, (place the thickest vegetables such as carrots nearest to the base of the steamer where it is hottest, and the thinner vegetables such as beans, cabbage etc in the higher tiers so that all your vegetables are ready to eat at the same time). The cooked vegetables don't require any straining. No need to use oil as you would have to if you roasted the vegetables. Easier washing up as no saucepans required. Other foods you can steam cook. 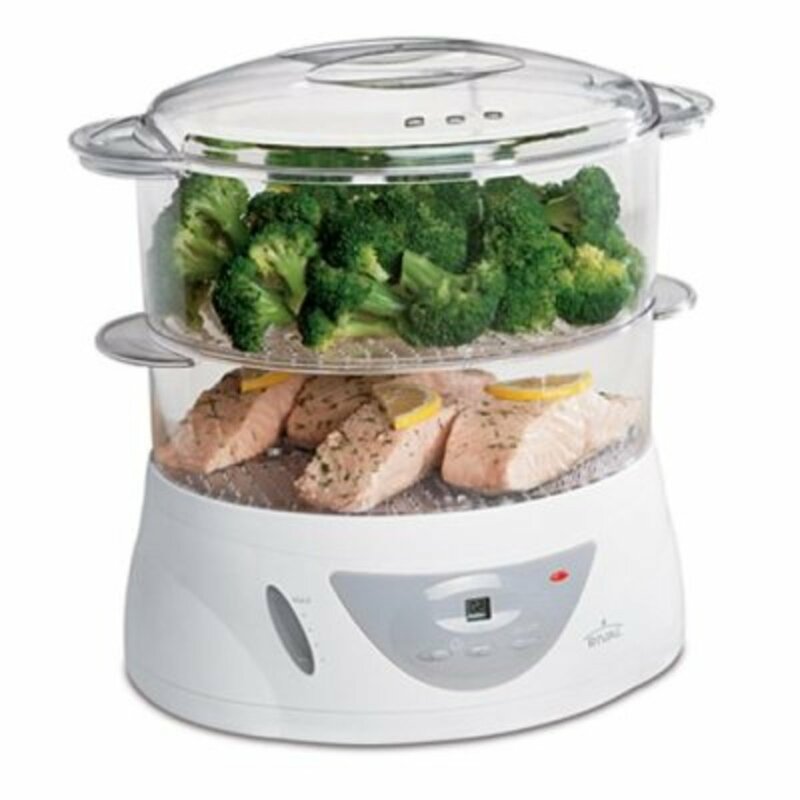 Other advantages to owning a steamer are the non-vegetable foods you can also cook in them, and therefore ensure most of the foods you are eating are as healthy as possible. Rice. Most tiered steamers come with a rice basket which will allow you to steam perfect, non-mushy rice every time, again with a minimal use of water and easy washing up afterwards. Pasta. This can be steamed in the same way as rice. Fish. Much like vegetables steamed fish retains more of the nutrients, flavours and natural colours, (actually even without a steamer you can steam fish by double wrapping it in foil and putting it through a hot dishwasher cycle). Meat. Suitable meats for steaming include chicken, bacon, ham and lamb, (avoid steaming beef as it can become tough, dry and tasteless). Eggs. You can even "boil" an egg using a steamer rather than immersing the egg in boiling water. Crabs and Lobsters. These can be steamed either live (although morally I would struggle with that method), or you can buy them frozen and then steam them. Puddings. Christmas pudding being a classic example, haggis (cooked in sheep's intestines), chocolate puddings, sponge puddings, etc. Suet Puddings both sweet and savoury. Jam suet pudding, golden syrup pudding, treacle pudding, jam roly poly's, Bramley apple pudding, steak and kidney pudding, Yorkshire suet pudding, steak suet pudding, game bird pudding, venison pudding etc. Fruits. Rhubarb, Apples, etc can be steam cooked. Overall advantages of steaming foods. 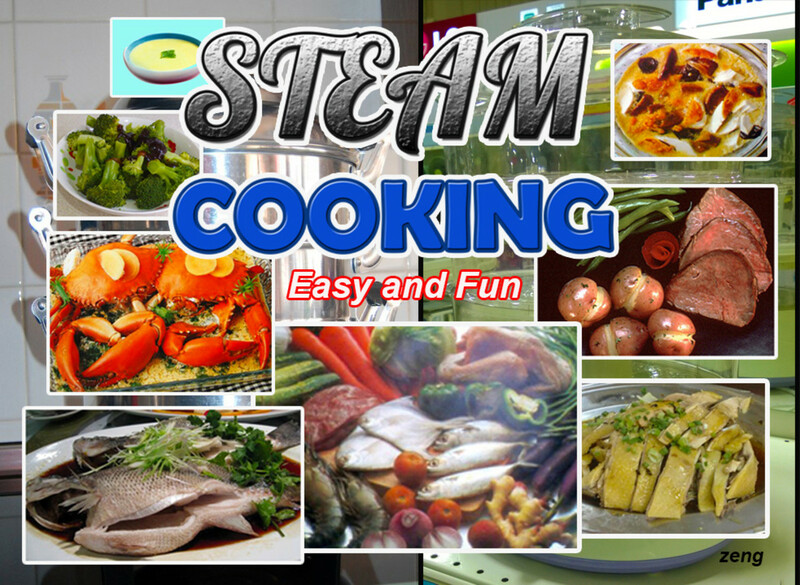 Steam cooking only destroys about 40% of Vitamin C in vegetables, whereas boiling destroys as much as 70% because it is lost in the cooking water. Foods are generally more nutritious when steamed, especially as additional fat is not required for cooking therefore the foods are left healthier and lower in fat. Steaming gives tender results because foods are not exposed to the intense, dry heat that can be associated with other cooking methods. 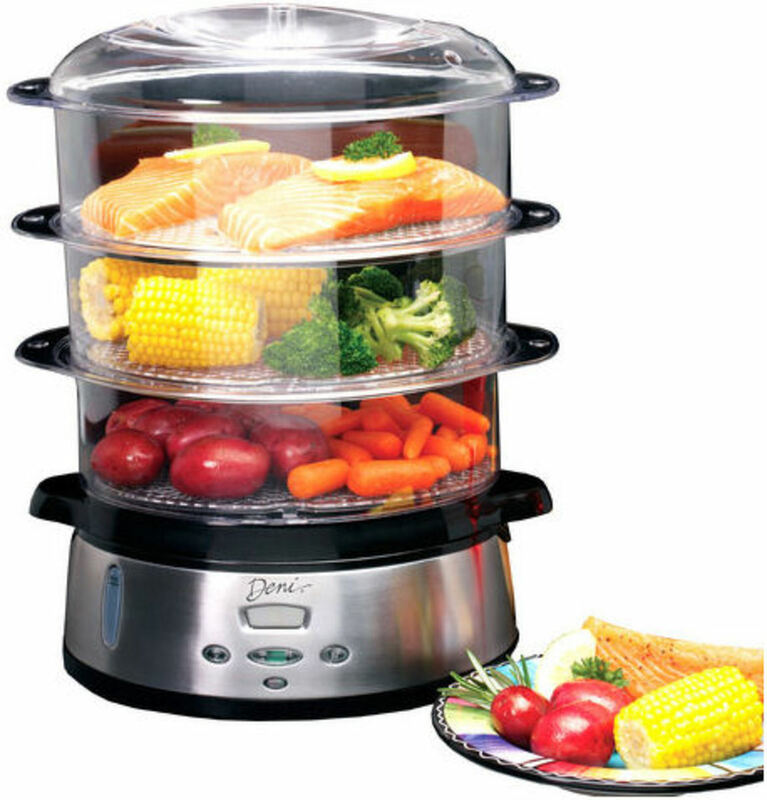 Steaming does not immerse foods in water into which nutrients, especially in vegetables, can escape. Flavourings may be added to foods via the steaming liquid, for example stock cubes, herbs and spices, or even wine. This hub has mainly concentrated on the electric, tiered design of steamers, but it is possible to steam foods in your microwave, or buy saucepan style steamers containing a trivet or rack. Pressure cookers can also be used for steaming, although it is harder to judge when your food is cooked because the lid cannot be removed until the pressure has dropped to safe levels, and therefore if the food is underdone it will take time to return the pressure cooker to the correct pressure for cooking. 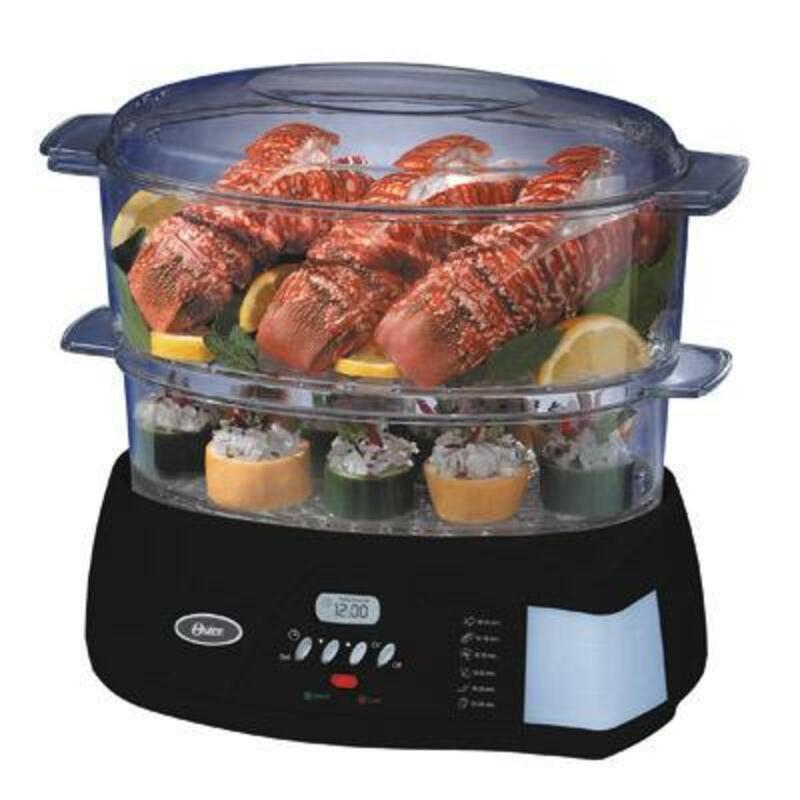 Personally I prefer the electrical steamers because they are easy to clean, the contents are clearly visible, (so it is easy to see when food is ready), the foods are not cooked "under pressure" so they can be checked physically at any time and they have built in timers that will switch off the unit once the cooking time is reached. 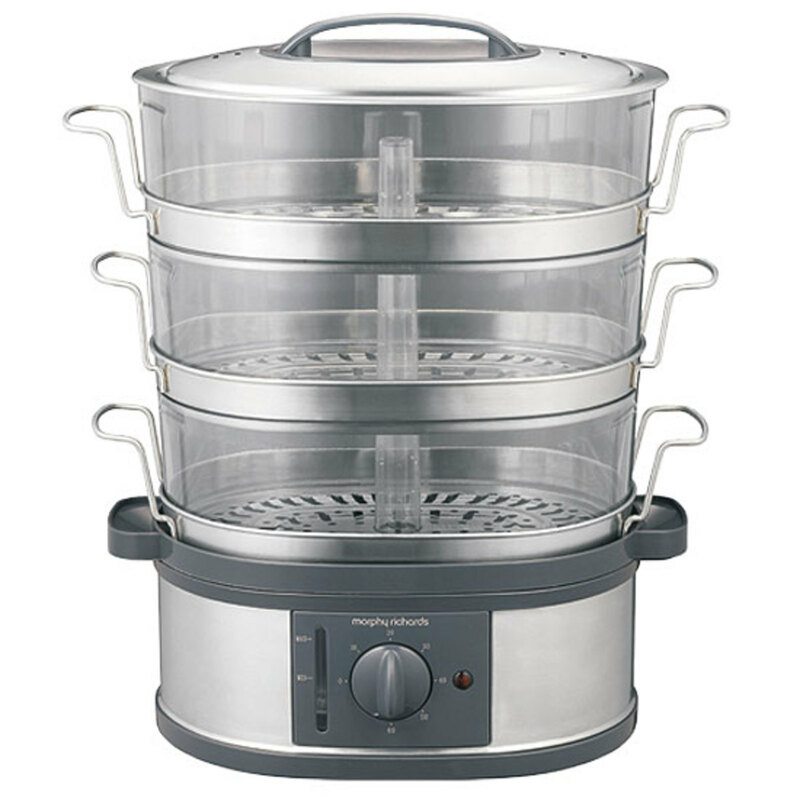 I highly recommend these affordable steamers as an essential cooking appliance for every kitchen. I honestly don’t know on this one Ena, never tried it. I would refer to your instruction manual or to the manufacturer to check. Personally I am confident bacon on its own would work well, but not sure about suet puddings. I love the oil free benefit , but I am not a meat eater anymore.great article if a little promotional. You certainly can steam chicken, and it works really well ensuring you have moist succulent and healthy chicken to eat when it is done. Can I steam raw oysters in my Deni? I may have to get one very soon.. 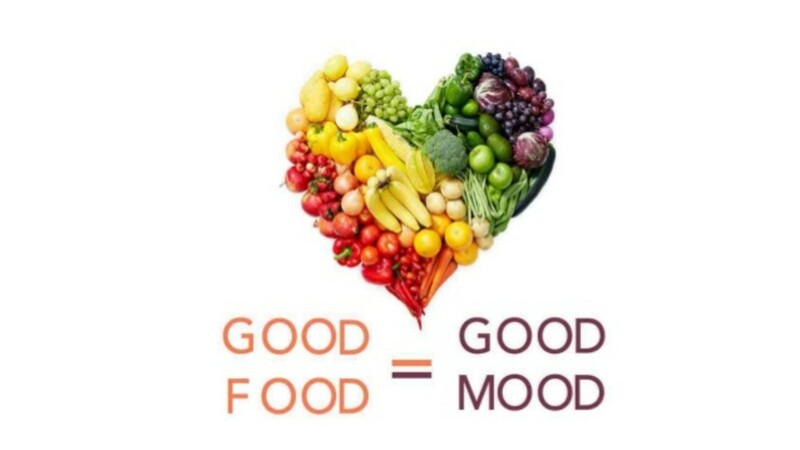 The food tastes even better if you ask me CHarlo, the flavours are not lost in the water as in boiling, plus the food hangs on to more of the actual goodness, vitamins etc. yes i might buy one but im not sure yet. I'm not sure if the food will taste as nice though?? Hi HP, thanks for commenting and I hope you do give steaming your food a try. Hi Paradise, always great to have your feedback, and I hope this hub will prove useful to you in the future if you buy a steamer. Once again, a winner from Misty!!! Bookmarking it this instant, for future reference! Yes, I shall try to use it in our system. Thanks forbsharing. Miss her so very much. Well, I would hate to hear anything had happened to you due to high cholesterol etc Ashwin. Your late girlfriend would not have wanted that either, so perhaps through me she wants you to get a message to look after yourself! Hi Hypnodude, hope you do buy one, as they are easy to use and I am sure your partner can use one to benefit both of your health, plus improve the flavour etc of your food. Hi Ashwin, yes, food does taste great fried, but unfortunately this food is probably the least healthy and most harmful of all. 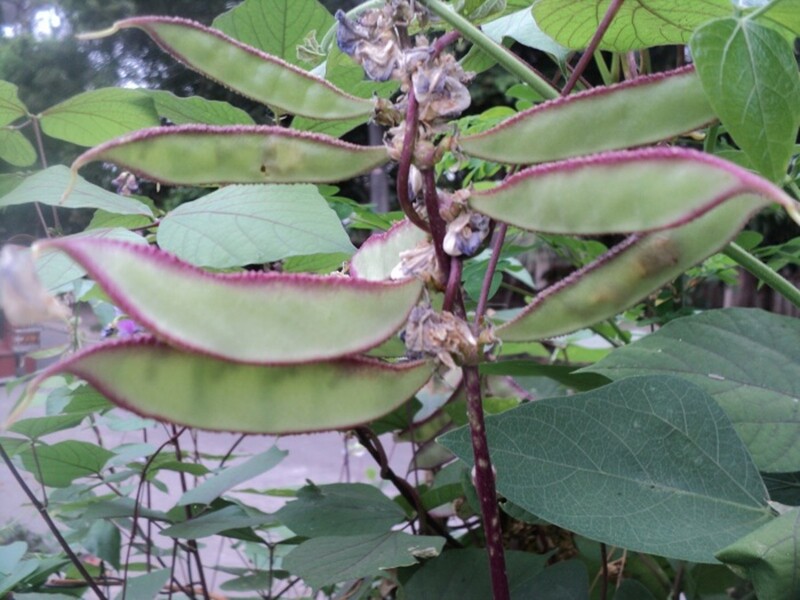 It might be lovely when you are eating it, but you are probably knocking years off your life by frying it. The Chinese here in Singapore love their food steamed. Its really healthy and i also understand that our food especially the vegs, fish and chicken will retain their original taste if we steamed them.I prefer my meal to be fried and well cooked in oil and spices. No steaming for me.Nice work on the hub Miss Misty. Misty, honestly I'm much better at eating than at cooking. But this hub is very interesting and useful. If I get single again I'll definitely buy one. :) But probably it's better if I bookmark this hub for next Christmas. Great tool for little money.